Water is an essential resource to every living-creature on Earth. We, human beings, have more than 50% of our body composed basicly by water. Like every limited resource, the only way of using this the best as possible is measuring its consumption to fix how you use the resource (an engineering rule: there's no improvement without measuring!). Considering these facts, measure and improve water consumption may mean saving the planet Earth / keeping all the living-creatures alive. So, it's a big thing measuring water consumption. Seeing a little bit beyond, to "complete" a really big thing, there'll be very nice the possibility to set the consumption's limit (so, consumers of water can effectively change the way they use water due to minimize its consumption and reduce the bills - what's no bad idea too!). And it's what this project do: help you to reduce water consumption in a clever way! Due to rising of embedded technology and the recent IoT (Internet of Things) boom, it's possible to not just measure water consumption, but send alerts of excessive consumption over the Internet too (using limits of water consumption defined by consumer). In other words: if you have Internet access and this project running in your home, doesn't matter where you are, you'll be able to check how it's your water consumption in your house, in real-time. Contribute for Earth's future using technology. One water sensor flow (like this one: http://www.seeedstudio.com/wiki/G1/2_Water_Flow_sensor ). Some wire and alligator clips. A 5V DC power source (you can use an old 5V cellphone battery charger, it'll work like a charm). To this project work as we want to, we'll need to make SparkFun Blynk Board and Blynk App communicate each other. Metering section: contain all information obtained by BlynkBoard (water flow and consumption and a representation of breathing light) and two important commands / button actions: Cons. reset (it allows resetting water consumption) and Get Version (it gets the BlynkBoard software version, what can be very useful on bug tracking). History: Here, it's possible to check all water flow and consumption history. It's a very interesting resource, because it allows users to check graphically their water consumption and flow meterings during the time. Calibrate: Third and last section of app. Here, it's possible to start and end calibration of Blynk Board. The calibration commands are all sent by Internet, so the user does not need to be near the Blynk Board / press buttons on Blynk Board to calibrate this system. Here there are what you need to make this project alive! Once the code is loaded into Blynk Board, it's almost ready to operation. Considering it's the very first time the Board is powered on, a calibration is needed (because, until now, Blynk Board "doesn't know" how many pulses are equal a 1 l measured). 1 - Be sure Blynk Board is on and connected to Internet. 4- Make exactly 1 liter of water pass through the water flow sensor. 6- Calibration is complete! Enjoy! Once calibration is complete, Blynk Board is ready to sent measurent information to BlynkApp. All the information sent to Blynk App can be seen on Mettering section. It's also possible to check water flow and consumption over the time. To check this feature, just go to History Section. In this chart, the red line shows water consumption and the black line shows water flow. Time to see this project in action! Here is the full schematic and diagram of this project. The wiring here is very simple (alligator clips, wire and some solder iron will make it real). Here is the whole code of this project. 1) It logs almost everything made (from sensor data acquisition to sending data to Blynk App). 2)To store calibration value (for water sensor measurement), an EEPROM was emulated on flash memory of the board. This emulation was made with native EEPROM library from Arduino. 3) Two functions (write and read long data from EEPROM) were obtained in Arduino Playground site (http://playground.arduino.cc/Code/EEPROMReadWriteLong). There are references to origin of this source code when I used it (so, it fits in license terms of Arduino Playground codes). 4) Before uploading this code to your SparkFun BlynkBoard, don't forget to write your Blynk Auth Key, SSID and password. 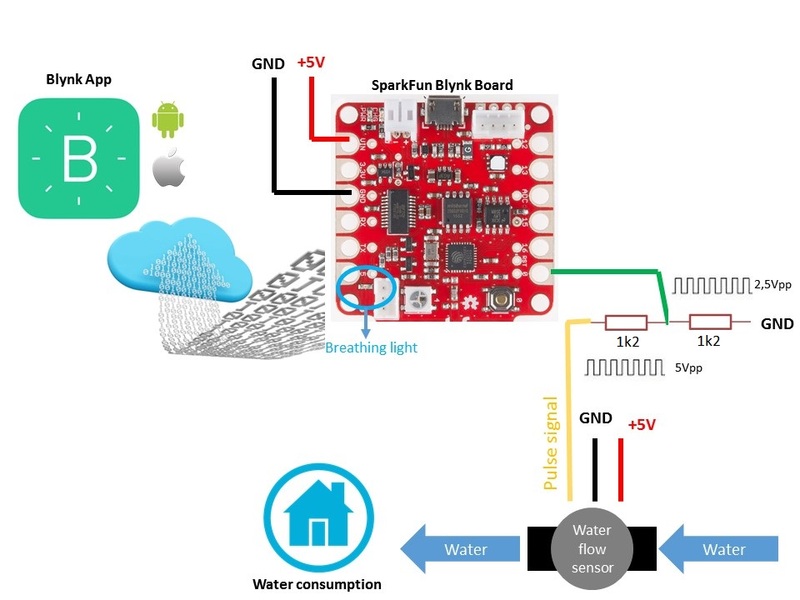 * Internet, using Blynk Board, Blynk App and water flow sensor. //Function: send calculated water flow and consumption to Blynk App. //Function: starts EEPROM and reads values. If there is no relevant data, default data is written in EEPROM. //reads first 48 bytes (EEPROM key size) to check if data written on EEPROM is relevant. //If yes, load it. If not, start EEPROM data with default values. //Setup function. Here the inits are made!